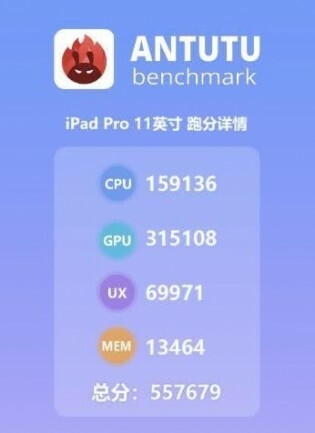 The first Apple iPad Pro benchmarks arrived on Thursday, revealing a massive increase in GPU performance for the A12X Bionic over the A12 Bionic in the newest iPhones. Today AnTuTu also revealed the score for the latest slate, and it confirmed the superiority of the newer chipset. The iPad Pro 11” yielded the massive score of 557,679, or over 50% increase from the iPhone XS and iPhone XS Max that we tested a month ago. The result can be broken down to four core components – CPU, GPU, UX, and Memory. AnTuTu reported an iPhone XS Max score that is similar to ours, but we’ll use theirs for the sake of consistency. CPU went from 131,000 to over 159,000, which is a minor improvement. A similar progressive growth can be seen in the UX and Memory department, but the GPU is where the magic happens. The A12 Bionic chip reached a bit over 153,000 with the iPhone XS Max, but due to better optimization, the A12X jumped twice and amassed a result of 315,108. The new graphics unit is an in-house Apple solution that allows better multi-layer rendering and lossless memory compression. Although performance is massively increasing, Apple promised power consumption wouldn’t be compromised. We sure hope so, given there is also a new NPU and over 10 billion transistors, compared with “just” 6.9 billion in the A12.